When the 3DS was first released, an unlikely champion quickly rose to the top of a lot of early adopters' "most played games." Find Mii, the free, bare-bones, turn-based RPG that's included with the console was quick to capture and retain the attention of many. The game was so popular that Nintendo even released a sequel earlier this year, with tons of new enemies and funny little hats to collect. Find Mii 1 & 2 have two major flaws. The games offer little to no exploration. They are basically just a series battles with a few branching paths, sort of a turn-based rendition of a single-player fighting game. They also rely on StreetPass to initialize their major hook -- acquiring new Mii characters from other players and using them in combat. 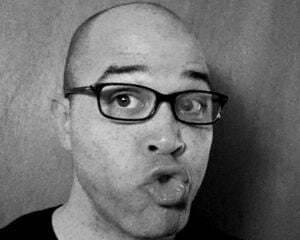 The "Denpa" Men: They Came By Wave looks to fix both of those flaws, while swapping out the Miis for some weird men in skin-tight, one-piece jumpsuits. The results are pretty wonderful, though there are a few issues that keep the game from grasping perfection. The game starts with the meeting a randomly generated Denpa Man (mine was little shrimp named Gerard wearing white eyeliner) who invites you to "take the red pill" and open your mind to the truth about reality: the Denpa Men are everywhere! These little goofs come in a huge variety of shapes, sizes, and styles (many with mustaches! ), and they are in your home right now. They are even in the toilet, watching you poop. From the looks of them, they're totally cool with that. I even saw my cat poop on one, and he just looked at me like "Hey, what's up?" Pretty badass. The Denpa Men are probably so nonchalant about cat poop because they are not a part of our corporal existence. 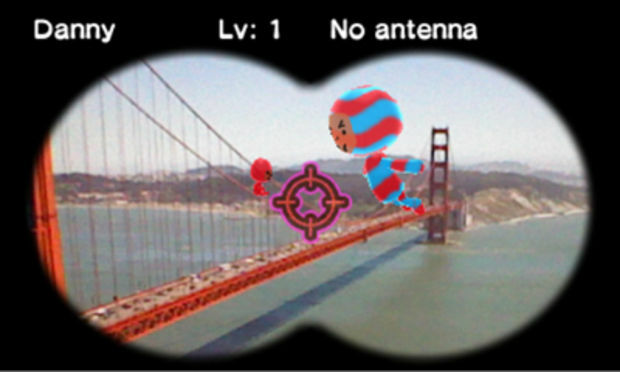 The only way you can see them (and catch them) is through the magic of the 3DS camera. 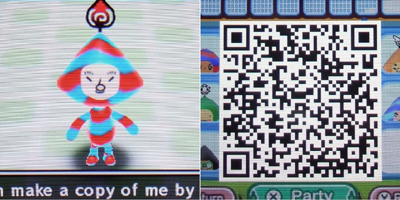 This is how the game bypasses the flaws of Find Mii's StreetPass method to gain new characters. Unlike in Find Mii, you can snag a load of new party members from any Wi-Fi connection. The "Denpa" Men reads undisclosed data from the wireless signal and creates a cavalcade of Denpa Men for you to catch. Every Wi-Fi signal is slightly different, which means you won't find the exact same Denpa Men in any particular spot. You can also use QR codes to beam them in and out of your game, which is a huge boon for those who have trouble scoring a wireless Internet connection. Regardless of how you hunt them, with over 100 different Denpa Men in the wild, it will be a while before you see them all. 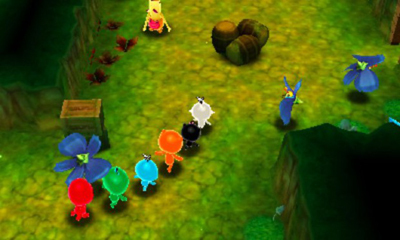 Catching a diverse group of these little Katamari-cousin looking barbarians is a big deal, as The "Denpa" Men follows the same kind of rock/paper/scissors-centered combat you might find in Nintendo's biggest RPG franchise, Pokémon. There are seven elemental forms in all, though some Denpa Men come in swirled varieties that have multiple tolerances and vulnerabilities. 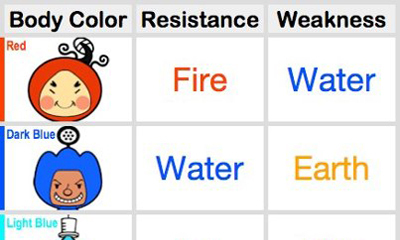 Each Denpa Man's elemental status is designated by its color (Black = Normal, White = Light, Red = Fire, Light Blue = Ice, etc). Earth is strong against Wind, but weak against Water, and so forth. A Denpa Man's attributes are also designated by their physical size and shape. Bigger guys tend to have more HP and attack power, but smaller guys are faster and are better at dodging. There are also some Denpa Men who know magic, which is split into the usual RPG types (attack, healing, and stat-enhancing, to name a few). Finding a Denpa Man with a variety of traits can make all the difference. You may be getting killed in a fire dungeon, but after scoring a red Denpa Man with a water hose on his head, you'll suddenly have a much easier time progressing. His fire type makes him resistant to other fire-based attacks, but he can use that hose to deal double or triple damage to any other fire-type opponent. You'll need to apply that type of thinking all the time in order to survive The "Denpa" Men. The game starts you off with a maximum party of four, but quickly expands to eight, and you'll need them all to make it. Balancing how many magic-infused Denpa Men you need compared to how many fighters, which types of magic you want in your party, and what equipment and clothes you're going to outfit them with will make all the difference in how long you can last. It's pretty well trodden stuff for fans 8-bit-era RPGs, but that doesn't make it any less fun. The game's dungeon structure will also feel familiar to fans of RPGs from the pre-Final Fantasy VII era. As the game progresses, dungeons get increasingly large and difficult to navigate, with plenty of wrong turns and secret treasure chests to find. Sadly, the game doesn't have a traditional overworld to balance out the constant tension that comes with dungeon crawling. Instead of an overworld, the Denpa Men live on a little island where you can find a shop, a library, and other niceties. From there, you can hit the docks to set sail for the world's various dungeons, which gradually unlock as you progress through the game. This process of unlocking dungeons is one of the things that surprised me the most about The "Denpa" Men. While it would completely ruin it to tell you the details, I will say that this is a game that did a fine job of tricking me into thinking that it was over, only to have it pull the rug out from under me and toss more fun my way. 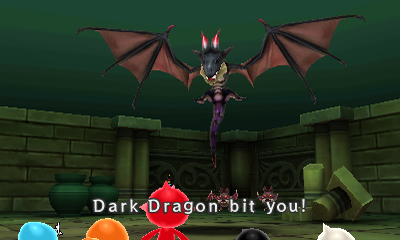 That, the surprisingly awesome music reminiscent of Earthbound/Mother 3, and the cute, bizarre monster design (including giant crocodile bugs, octopus-spider hybrids, sweet little flying pigs, and giant gymnastic molars), were some of the ways that the game went above and beyond the AR hook to offer something special. There are a quite a few other sweet spots that made The "Denpa" Men more fun than I expected. The combat is fast and easily steamlined. When you're taking on tough enemies, you'll want to customize every move, but against weaker enemies, you can just select auto combat, or better yet, auto combat with no magic which speeds things up and prevents the computer from getting too liberal with the use of your MP. The game also doesn't bog you down with much story, though what writing there is does seem like a cross between Animal Crossing and Mario, which makes it feel right at home on a Nintendo console. I was also impressed by just how long this game is. Even the best strategists will have a tough time getting through the entire game in less that 16 hours. That impressive length is a blessing and a curse. Many of those 16 hours are grueling and strenuous. This is game that isn't afraid to kill you, and make death feel meaningful . Semi-perminant death is in play here; as you leave a dungeon with a dead Denpa Man, they move on to the afterlife. From there, they can only be brought back through a highly expensive means. With no guarantee that you'll be able to survive to the next health regenerator, you'll flinch at every potentially homicidal hit landed on your army of Tingle-style warriors. Thankfully, these battles aren't randomly generated. You see enemies on screen before they attack, so you can always try to outrun or outfox a foe before they lock horns with you. While I felt engaged (usually with fear) during most of my play time with The "Denpa" Men, I did start to feel the game lose its spark around half way through. The game starts to recycle enemy character models, swapping them with different color palettes and elemental attributes, which diminished how engaged I felt with the combat. Entering a new dungeon where you must use water to kill a cute little red pig instead ice to kill a cute little green pig feels like bit of a cheat. Still, it doesn't take long for the game to start mixing things up again by challenging you with hordes of enemies with multiple elemental properties, which did a lot to refresh my interest. The "Denpa" Men feels like a great first step that's just begging for a more fleshed-out sequel. The game's lack of emphasis on linear storytelling and focus on dungeon crawling and turn-based combat feels like a breath of fresh air for an old jerk like me who'd rather play Final Fantasy 1 over Final Fantasy XIII. On top of that, a sequel to the game has already been announced for Japan, complete with a traditional RPG overworld map, more locations to explore, and fishing. In the meantime, I still have plenty of Denpa Men to catch and secrets to hunt for. While The "Denpa" Men may not be complex or particularly innovative, it offers more than enough content to keep fans of classic RPGs busy, all wrapped up in a strange and charming one-piece pajama jumpsuit.